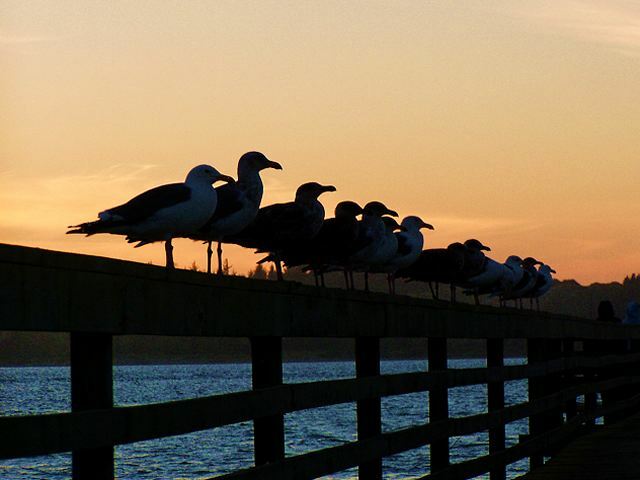 The gulls can't sit or recline, but they are resting for the evening. Hope this meets challenge rules. I tried for some closer shots, but when I did, I disturbed their rest and off they flew. This photo has minimum saturation and some sharpening. I tried the unsharp mask, and didn't like it, so changed it. I know it's blurry, but don't know how to sharpen it and still have the blending that I want for the calming effect. HEY Nice job of sneaking on our cam page! :) Jason and I ruled this roost for SO long it's nice to have new competition (now that he's upgraded). Great colors! and the perspective works well here as well congrats on a top ten shot! Congratulations, Silent Sister! Wonderful photo. Just love those birds. Thanks so much to everyone who voted for and commented on my photo. I'm taking the comments and suggestions seriously and appreciate the time each of you haven taken. I didn't realize I'd made the top 10 when I first started this post! Yipee!!!! :) :) I just looked down at Sonifo's post and saw what she'd said. This is pretty exciting for me. Message edited by author 2003-10-01 00:30:13. Go Nita, Go Nita, Go Nita. And a wonderful shot besides. Good work. I love the colors and the silhouette effect of the gulls. Can't wait to see more of your work!! Very nice!! This shot is awesome. Way to go for getting in the top 10. Uh oh, birds mounting an attack! I love the colors in this one. That gentle yet brilliant orange contrasted after a thick line with a prestine blue. The birds add a great subject. Just a thought though, the orange is rather expansive where the blue is very cut off. Maybe even out the space between them? Super comp, colors and silhouettes...I'd knock off some of the right side and compensate at the top for just a suggested improvement....maybe? like it very much as just seems that the BG behind the fence on the right next to last gull distracts me a bit. Great colors, I like the lighting. This is so nice. I love the birds silhouetted against the sky. It has a real feeling of calm. Colours and composition and subject interesting well caught but not sure about how strong it meets the challenge. Nice! Shame the trees/ hill behind mean that one cant see silhouettes for all the birds in the row. Would moving around at all have helped with that? I like the image but more for the potential of what is almost a superb image. looks good. some fill flash to bring out the details in the birds might be good, but you probably still wouldn't be able to see the ones at the back.... i like the way it was positioned as well. great shot! Great shot. The gulls and sun going down works well. Beautiful lineup of seagulls. The beautiful sunset in the background really helps to bring the birds out of the picture. The angle of the rails that you captured makes your eyes go from left to right and look at each bird. Great work. Great photo. Nice color, composition and angles. Great composition. Love the lighting. The way the sky and the water contrast with each other is almost at rest on its own. I like how the birds are kinda organized, they look like they might just march off. Wonderful photo. Proudly hosted by Sargasso Networks. Current Server Time: 04/26/2019 09:40:40 AM EDT.